Stata is a complete, integrated statistical software package that provides everything you need for data science. Fast. Accurate. Easy to use. Stata is a complete, integrated software package that provides all your data science needs—data manipulation, visualization, statistics, and reproducible reporting. Stata's data management features give you complete control. And much more, to support all your data science needs. 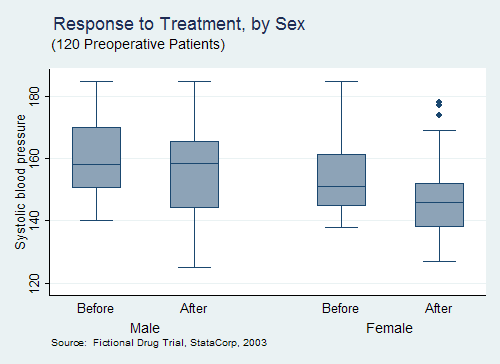 Stata makes it easy to generate publication-quality, distinctly styled graphs. You can point and click to create a custom graph. Or you can write scripts to produce hundreds or thousands of graphs in a reproducible manner. 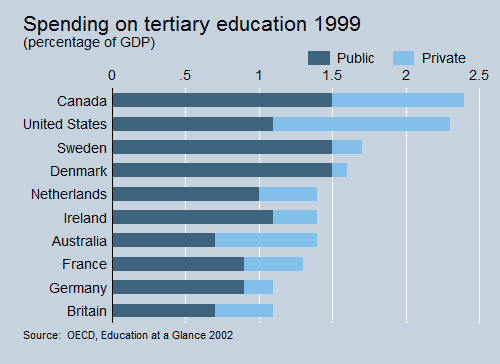 Export graphs to EPS or TIFF for publication, to PNG or SVG for the web, or to PDF for viewing. 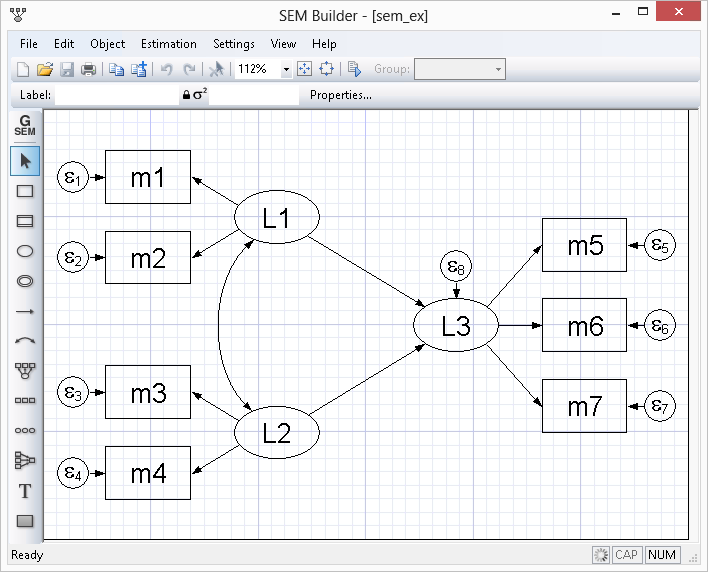 With the integrated Graph Editor, you click to change anything about your graph or to add titles, notes, lines, arrows, and text. All the tools you need to automate reporting your results. Lots of folks talk about reproducible research. Stata has been dedicated to it for over 30 years. We constantly add new features; we have even fundamentally changed language elements. No matter. 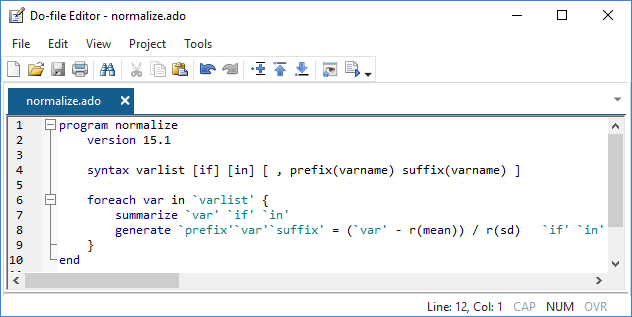 Stata is the only statistical package with integrated versioning. If you wrote a script to perform an analysis in 1985, that same script will still run and still produce the same results today. Any dataset you created in 1985, you can read today. And the same will be true in 2050. Stata will be able to run anything you do today. When it comes time to perform your analyses or understand the methods you are using, Stata does not leave you high and dry or ordering books to learn every detail. Each of our data management features is fully explained and documented and shown in practice on real examples. Each estimator is fully documented and includes several examples on real data, with real discussions of how to interpret the results. 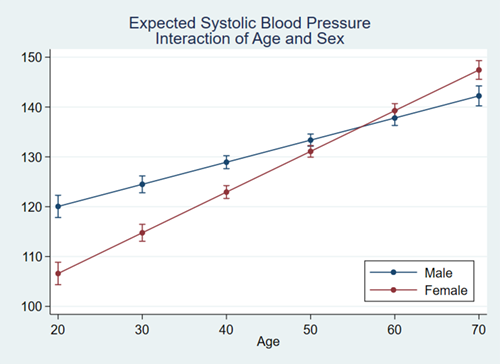 The examples give you the data so you can work along in Stata and even extend the analyses. We give you a Quick start for every feature, showing some of the most common uses. Want even more detail? Our Methods and formulas sections provide the specifics of what is being computed, and our References point you to even more information. Stata is a big package and so has lots of documentation – over 14,000 pages in 27 volumes. But don't worry, type help my topic, and Stata will search its keywords, indexes, and even community-contributed packages to bring you everything you need to know about your topic. Everything is available right within Stata. We don't just program statistical methods, we validate them. The results you see from a Stata estimator rest on comparisons with other estimators, Monte Carlo simulations of consistency and coverage, and extensive testing by our statisticians. Every Stata we ship has passed a certification suite that includes 2.3 million lines of testing code that produces 4.3 million lines of output. We certify every number and piece of text from those 4.3 million lines of output. 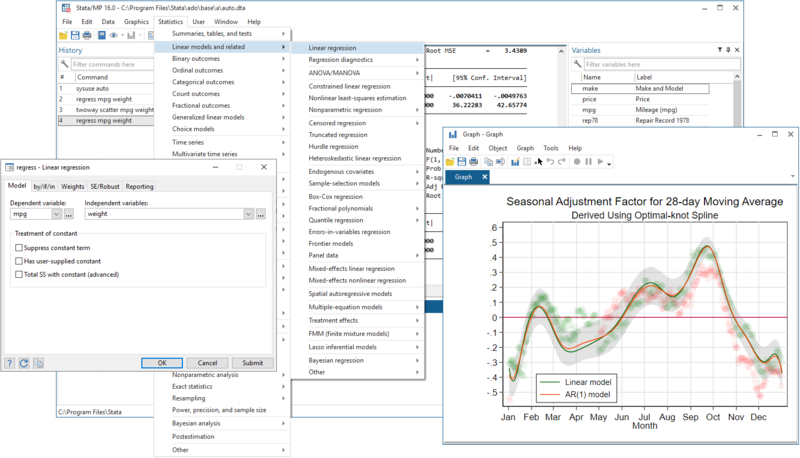 All of Stata's features can be accessed through menus, dialogs, control panels, a Data Editor, a Variables Manager, a Graph Editor, and even an SEM Diagram Builder. You can point and click your way through any analysis. If you don't want to write commands and scripts, you don't have to. Even when you are pointing and clicking, you can record all your results and later include them in reports. You can even save the commands created by your actions and reproduce your complete analysis later. Stata's commands for performing tasks are intuitive and easy to learn. Even better, everything you learn about performing a task can be applied to other tasks. For example, you simply add if gender=="female" to any command to limit your analysis to females in your sample. You simply add vce(robust) to any estimator to obtain standard errors and hypothesis tests that are robust to many common assumptions. The consistency goes even deeper. What you learn about data management commands often applies to estimation commands, and vice-versa. There is also a full suite of postestimation commands to perform hypothesis tests, form linear and nonlinear combinations, make predictions, form contrasts, and even perform marginal analysis with interaction plots. These commands work the same way after virtually every estimator. Sequencing commands to read and clean data, then to perform statistical tests and estimation, and finally to report results is at the heart of reproducible research. Stata makes this process accessible to all researchers. Everyone has tasks that they do all the time—create a particular kind of variable, produce a particular table, perform a sequence of statistical steps, compute an RMSE, etc. The possibilities are endless. Stata has thousands of built-in procedures, but you may have tasks that are relatively unique or that you want done in a specific way. If you have written a script to perform your task on a given dataset, it is easy to transform that script into something that can be used on all your datasets, on any set of variables, and on any set of observations. Some of the things you automate may be so useful that you want to share them with colleagues or even make them available to all Stata users. That's also easy. With just a little code, you can turn an automation script into a Stata command. A command that supports standard features that Stata's official commands support. A command that can be used in the same way official commands are used. Stata also includes an advanced programming language—Mata. Mata has the structures, pointers, and classes that you expect in your programming language and adds direct support for matrix programming. Though you don't need to program to use Stata, it is comforting to know that a fast and complete programming language is an integral part of Stata. 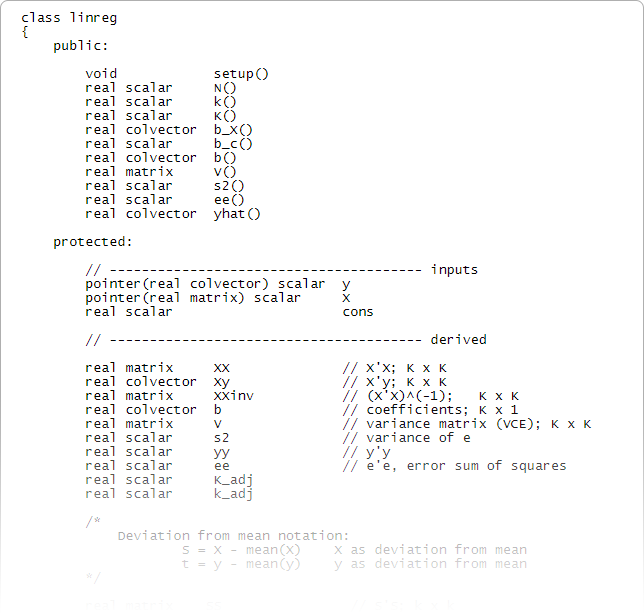 Mata is both an interactive environment for manipulating matrices and a full development environment that can produce compiled and optimized code. 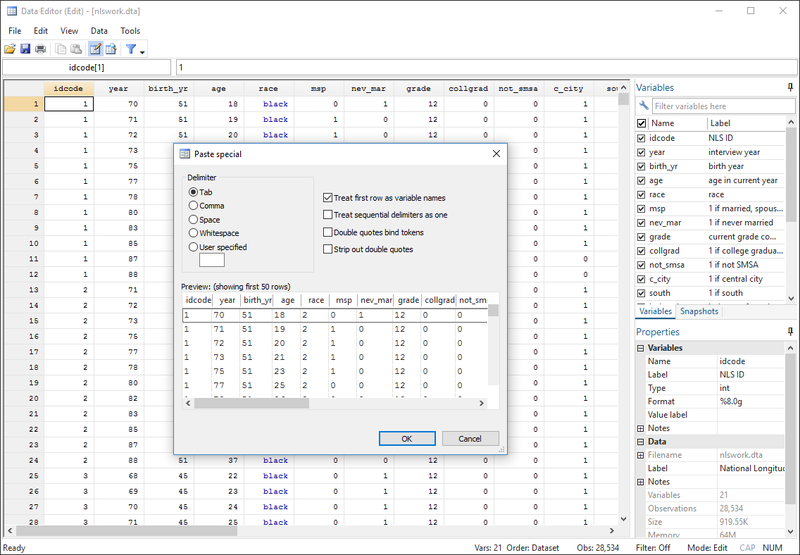 It includes special features for processing panel data, performs operations on real or complex matrices, provides complete support for object-oriented programming, and is fully integrated with every aspect of Stata. Stata even let's you incorporate C, C++, and Java plugins in your Stata programs via a native API for each language. Get the most out of your multicore computer. No other statistical software comes close. 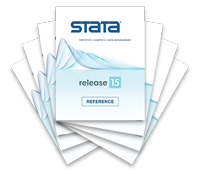 Enjoy the new features of Stata 15 at top speed. Stata is so programmable that developers and users add new features every day to respond to the growing demands of today's researchers. With Stata's Internet capabilities, new features and official updates can be installed over the Internet with a single click. Stata technical support is free to registered users, which means you get much more than you pay for. We have a dedicated staff of expert Stata programmers and statisticians to answer your technical questions. From tricky data management solutions to getting your graph looking just right and from explaining a robust standard error to specifying your multilevel model, we have your answers. Stata will run on Windows, Mac, and Linux/Unix computers; however, our licenses are not platform specific. That means if you have a Mac laptop and a Windows desktop, you don't need two separate licenses to run Stata. You can install your Stata license on any of the supported platforms. Stata datasets, programs, and other data can be shared across platforms without translation. You can also quickly and easily import datasets from other statistical packages, spreadsheets, and databases. Used by researchers for more than 30 years, Stata provides everything you need for data science—data manipulation, visualization, statistics, and reproducible reporting. Select your discipline and see how Stata can work for you. Stata is distributed in more than 180 countries. Our authorized distributors offer services such as basic technical support and training, and carry Stata inventory so delivery is fast. Stata's YouTube channel is the perfect resource for new users to Stata, users wanting to learn a new feature in Stata, and professors looking for aids in teaching with Stata. We have over 250 videos on our YouTube channel that have been viewed over 5 million times by Stata users wanting to learn how to label variables, merge datasets, create scatterplots, fit regression models, work with time-series or panel data, fit multilevel models, analyze survival data, perform Bayesian analylsis, and use many other features of Stata. View the complete list of videos. We write the official Stata Blog, Not Elsewhere Classified (NEC), to share things we think you will find instructive, informative, or just plain entertaining. 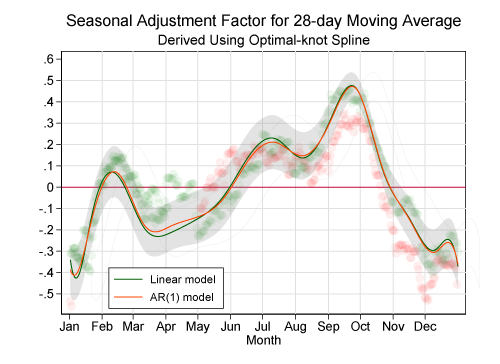 We have written about how to interpret statistical results; export results into Word, Excel, and LaTeX; perform Monte Carlo simulations; program your own estimators; and more. We also post service and product announcements. Individually signed, the articles in NEC are written by the same people who develop and support Stata. Stata webinars offer something for everyone. Those new to Stata will get a head start when they join our Ready. Set. Go Stata webinar. Both new and experienced users will want to join our Tips and Tricks webinar and our one-hour feature webinars; each one provides an in-depth look at one of Stata's statistical, graphical, data management, or reporting features. A multitude of training options are available to become proficient at Stata quickly. Stata provides hands-on classroom and web-based training courses, customized on-site training courses, and online training through NetCourses, webinars, and video tutorials. Stata Press® publishes books, manuals, and journals about Stata and general statistics topics for professional researchers of all disciplines. Stata Press® publications, along with books recommended by StataCorp, can be found in the Stata Bookstore. The Stata News is a free publication with columns such as the popular In the Spotlight, where Stata developers give insight into specific Stata features, and the User's corner, where we share unique, helpful, and fun contributions from the user community. The News also contains announcements such as new releases and updates, training schedules, new books, Conferences, and Users Group meetings. The Stata Journal is a quarterly publication containing articles about statistics, data analysis, teaching methods, and effective use of Stata's language. The Journal publishes reviewed papers together with shorter notes and comments, regular columns, book reviews, and other materials of interest to researchers applying statistics in a variety of disciplines. Whether you are a beginner or an expert, you will find something just for you at the Users Group meetings, which are held each year in various locations around the world. These meetings showcase in-depth presentations from StataCorp experts and experienced Stata users that focus on helping you use Stata more effectively. A great resource for users is Statalist, a forum where more than 30,000 Stata users exchange over 4,500 postings and responses each month. Statalist is run and moderated by Stata users and maintained by StataCorp. Our users love to share how great Stata is, so we'd like to show you! When we receive nice comments about Stata, we post them here. If you think Stata is great too, send us an email with your comment, and we may share it with the Stata community. Stata is not sold in modules, which means you get everything in one package! 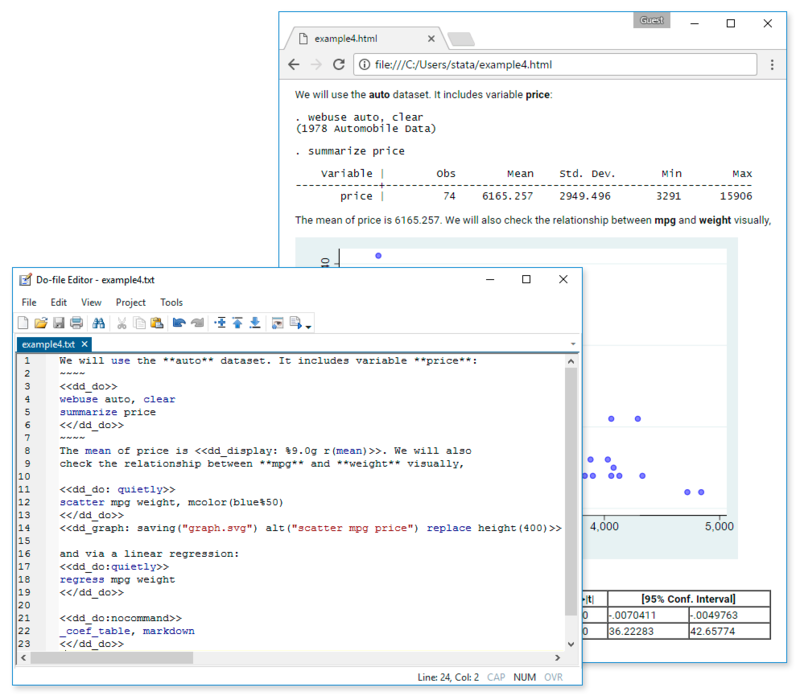 Stata offers several purchase options to fit your budget. You can choose between a perpetual license, with nothing more to buy ever, or an annual license. Contact a sales representative or browse our products to find out more about our affordable options. You can also download a product brochure. Stata is a complete, integrated software package that provides all your data science needs—data manipulation, visualization, statistics, and reproducible reporting. Stata is not sold in modules, which means you get everything you need in one package. And, you can choose a perpetual licence, with nothing more to buy ever. Annual licences are also available. Whether you're a student or a seasoned research professional, a range of Stata packages are available and designed to suit all needs. All of the following flavours of Stata have the same complete set of commands and features and manuals included as PDF documentation within Stata. Stata/MP is the fastest and largest version of Stata. Virtually any current computer can take advantage of the advanced multiprocessing of Stata/MP. This includes the Intel i3, i5, i7, i9, Xeon, and Celeron, and AMD multi-core chips. On dual-core chips, Stata/MP runs 40% faster overall and 72% faster where it matters, on the time-consuming estimation commands. 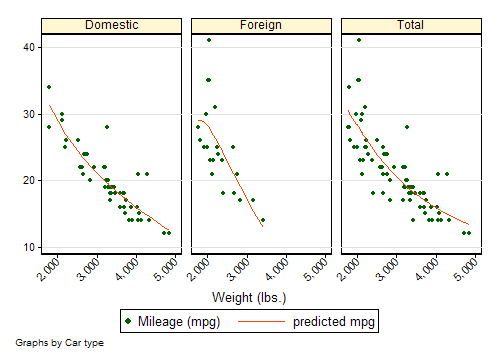 With more than two cores or processors, Stata/MP is even faster. Stata/MP is faster-much faster. Stata/MP lets you analyze data in one-half to two-thirds of the time compared to Stata/SE on inexpensive dual-core laptops and in one-quarter to one-half the time on quad-core desktops and laptops. Stata/MP runs even faster on multiprocessor servers. Stata/MP supports up to 64 processors/cores. Speed is often most crucial when performing computationally intense estimation procedures. A few of Stata’s estimation procedures, including linear regression, are nearly perfectly parallelized, meaning they run twice as fast on two cores, four times as fast on four cores, eight times as fast on eight cores, and so on. Some estimation commands can be parallelized more than others. Taken at the median, estimation commands runs 1.9 times faster on two cores, 3.1 times faster on four cores, and 4.3 times faster on eight cores. Stata/MP is 100% compatible other versions of with Stata. Analyses do not have to be reformulated or modified in any way to obtain Stata/MP’s speed improvements. To run Stata/MP, you can use a desktop computer with a dual-core or quad-core processor, or you can use a server with multiple processors. Whether a computer has separate processors or one processor with multiple cores makes no difference. More processors or cores makes Stata/MP run faster. For more advice on purchasing/upgrading to Stata/MP or for hardware queries, please contact our sales team. Stata/SE and Stata/IC differ only in the dataset size that each can analyse. Stata/SE and Stata/MP can fit models with more independent variables than Stata/IC (up to 10,998). Stata/SE can analyse up to 2 billion observations. Stata/IC allows datasets with as many as 2,048 variables. The maximum number of observations is 2.14 billion. Stata/IC can have at most 798 independent variables in a model. For Business License terms and options please click here. For Educational License terms and options please click here. Stata 15 has something for everyone. Below we list the highlights of the release. This release is unique because most of the new features can be used by researchers in every discipline. All versions of Stata run on dual-core, multi-core and multi-processor computers. * 64-bit Windows varieties for x86-64 and x86 processors made by Intel® and AMD. Linux: Any 64-bit (x86-64 or compatible) running Linux. Please note: The 32-bit and Solaris download options are still available, but by request only. Find out all about Stata’s expansive range of statistical features using the table of contents below. Each section links to further details and examples to help users get the best out of their software. community-contributed commands for meta-analysis, data management, survival, econometrics. compare to reference category, adjacent category, grand mean, etc. 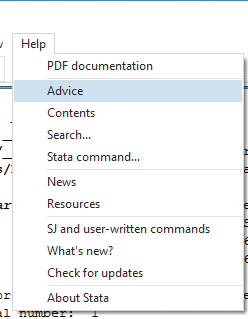 Every installation of Stata includes all the documentation in PDF format. Stata’s documentation consists of over 14,000 pages detailing each feature in Stata including the methods and formulas and fully worked examples. You can transition seamlessly across entries using the links within each entry. The Stata 15 documentation is copyright of StataCorp LLC, College Station TX, USA, and is used with permission of StataCorp LLC. Students may purchase Stata/MP, Stata/SE and Stata/IC at a discounted price. For more information about available licence types, click here.